Goodwyn Tea Presents Tea Gift Boxes which capture the most appreciated and loved flavours of Indian Tea. Each handpicked assortment of premium quality tea has been packed in beautiful, sleek and light weight gift boxes. Each box has been intelligently designed to take up minimal space. Kashmiri Kahwa Green: A blend of Cardamom, Ginger, Cinnamon, saffron with natural green tea immediately energizes you. Buy green tea online blended perfectly with Kashmiri Kahwa while it works miracles with its variety of health benefits. 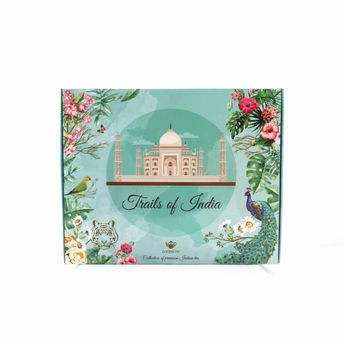 Perfect gifting option for all - A Convenient and Light Weight Gift in a Sleek Box which easily fits into your travel case or bag making it an ideal Indian Souvenir for Foreign Clients who can enjoy the best of Indian Flavours and Indian Culture in a Tea Cup!